During WWII an American aircraft ground maintenance crew salvaged the front of a badly damaged B-17, the tail end of another damaged B-17, and “built” the B-17 Flying Fortress pictured above that was named “Combined Operations.” The aircraft was attached to the 306th Bombardment Group, 367th Bomb Squadron, based in Thurleigh, England, and flew more than 80 combat missions over Europe. On April 14, 1945, “Combined Operations” was on a flight from Thurleigh, England, to Belfast, Ireland. The end of the war in Europe was in sight. That particular day the B-17 was on a training flight and “whiskey run” to purchase supplies for a party to be held at Thurleigh. In bad weather and fog, it crashed in a field on the southern coast of the Isle of Man which is located in the Irish Sea between England and Ireland. All aboard the B-17, ten men and one woman, were killed. 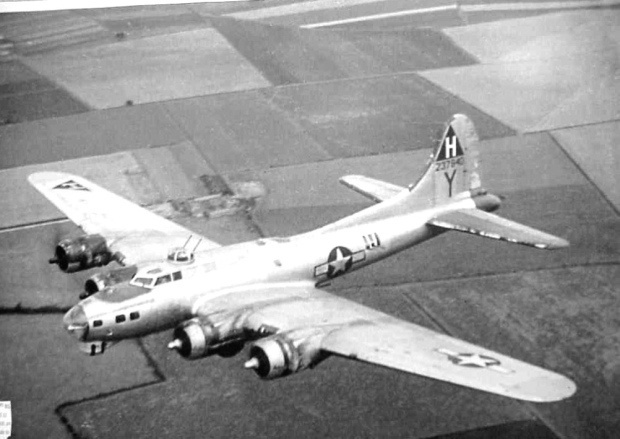 After a two day weather delay, a B-17 from the 367th Bomb Squadron at Thurleigh flew to the Isle of Man to gather crash information and to identify the bodies. The plane was flown by the 367th Bomb Squadron Commander, Major Earl Kesling. The three man military accident investigation team consisted of Major Kesling, the 367th Flight Surgeon, Captain Arthur Weihe, and the Lead Enlisted Medical Technician Staff Sergeant William Houlihan. Personnel from the Royal Air Force (RAF) Aerodrome based at Jurby, Isle of Man, had already collected the remains at the crash site. The bodies were in eleven wooden coffins lined up in the RAF base gymnasium when the Americans arrived. Major Kesling, Captain Weihe, and Staff Sergeant Houlihan personally knew many of the crash victims. The lady on the flight. Emily Harper Rea of the American Red Cross. 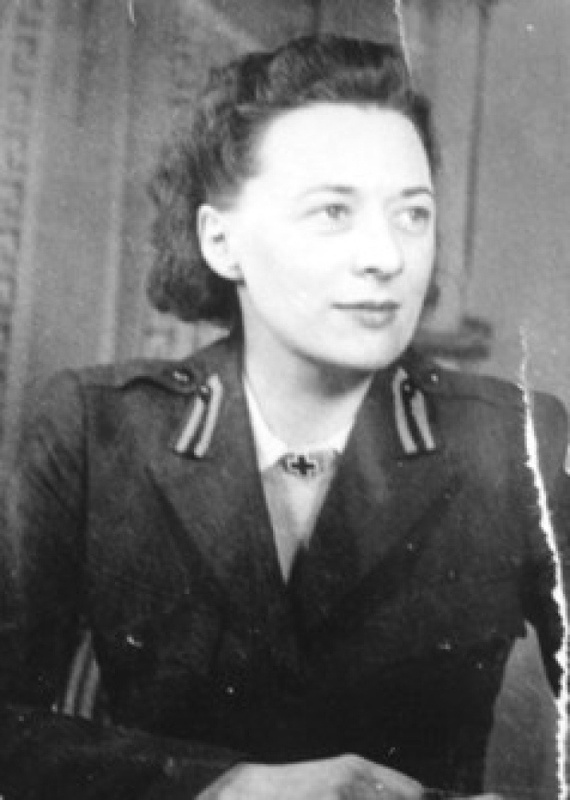 Emily Rea had been posted to the American Officers Red Cross Club at Bedford, England, near Thurleigh, in 1943. Her thoughtful and caring nature had endeared her to both American military personnel and the British community. She had been chosen to pin Major’s oak leaves on the newly promoted American big band leader Glenn Miller in the summer of 1944. In appreciation, Major Miller gave Emily his Captain’s bars. Later in 1944 Emily was posted to the American Red Cross Club in Paris. She had returned to Bedford in 1945 to visit her many friends. Scheduled to be on the April 14, 1945, flight was Sergeant George Kellogg who packed parachutes for the 367th Bomb Squadron. Emily was chosen to take his place on the flight. 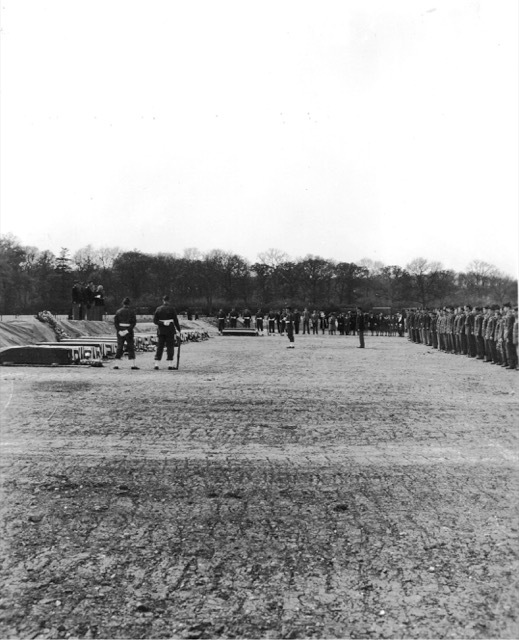 The bodies of those killed in the crash of “Combined Operations” were flown back to England and buried in the WWII temporary cemetery at Madingley near Thurleigh. 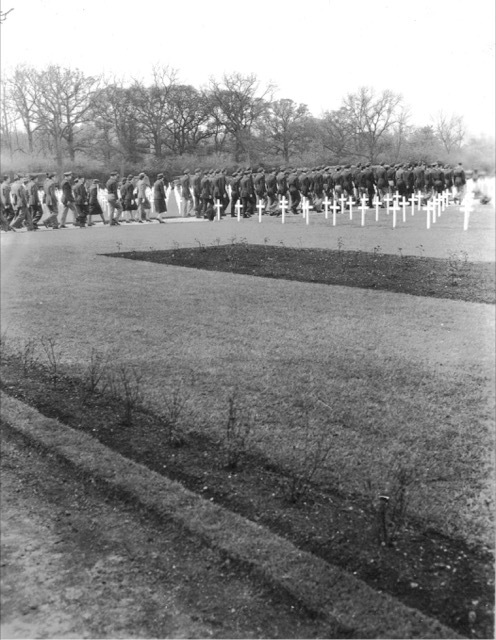 A formation of American military marching to the graveside service at Madingley Cemetery. The graveside memorial service for the eleven people killed in the crash. 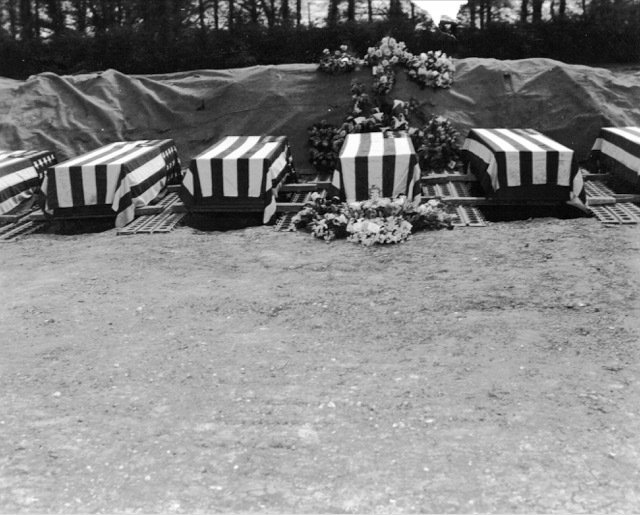 The flag-draped coffins are lined up on the left of the photograph. The temporary cemetery at Madingley is now known as the Cambridge American Cemetery and Memorial. It was dedicated in 1956 and is the only permanent American WWII cemetery in the British Isles. Emily Harper Rea and a number of the others killed in the plane crash on April 14, 1945, are still buried there. A special thank you to William “Bill” Houlihan for sharing his remembrances of the crash of “Combined Operations.” His photographs of the graveside memorial service are used with his permission.